Yesterday marked the latest step in Stone Ties’ history. The postman delivered the proof copy of my forthcoming paperback edition. After a day’s reading, and thankfully few changes, the final version has been submitted for review. 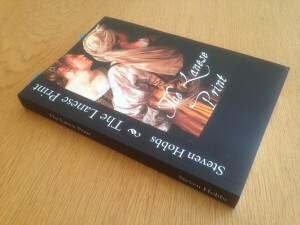 All being well it should be available to buy via Amazon (UK, Europe and USA) and CreateSpace in the next week or so. I’ll post an update here as soon as it is. I’m really pleased with the new cover design; a “flinty” departure from the original Kindle edition. 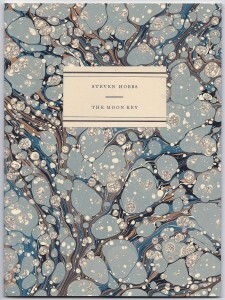 If you love fine printing, and a melancholy tale for Christmas, then The Moon Key is just for you. Grab a copy of this beautifully produced little book now, at the seasonal price of just £5 (plus postage and packing). 24th October 2015: Out Now - The Lanese Print in Paperback! Exciting times … from today you can buy a copy of The Lanese Print in all its glorious papery bookyness (as well as in Kindle format). Just roll on down to Amazon (UK, Europe or USA) or to the CreateSpace Store, to grab yourself a paperback copy. Why let the Kindle-ites have all the fun? For just a few pennies more you can touch it, feel it, shelve it, sniff it – maybe even read it! I’d love your support, I’d love your reviews, but most of all – I’d love you to read it! 18 September 2015: The Lanese Print – Coming Soon on Paper! It’s those small things – those uniquely fresh moments – those indescribable “firsts” in our lives that mean so much. And one such today, with the arrival of the printed proof of The Lanese Print. I can barely contain myself! A few days should see me through it – and not long after it will be out there, in all its gloriously tangible paper-ness, raring to fly to your door for a handful of pennies! More on the publication date soon …. 1 September 2015: The Lanese Print in Print! For all those that prefer the look, feel (and smell) of the printed book, I’m excited to announce that it will soon be possible to buy The Lanese Print in a print edition (via Createspace). The existing Kindle edition will still be available. I’m currently working through the review and proof-reading stages, and hope to have a publication date for the print edition shortly. I’ll post an update here as soon as I know. From today I’ve introduced a new Short Stories page to the site. You can go to it by selecting the Short Stories link below the Other Writing menu option (top right of the page). The aim is to bring together, over a period of time, old stories and new; some published, others not. I have no particular strategy as far as they are concerned, but write them when the moment takes me. Given time I hope you find something that you like here. And if you do, please send me a message and let me know. I’d love to hear from you! To celebrate the coming of spring I’ve significantly reduced the price of my short story The Moon Key. You can now buy a copy of this beautifully printed little book for only £8 plus p&p. So if you love fine printing, and a poignant tale, then why not read more about the genesis of the story and the creation of the book here: The Moon Key. You can also order a copy easily, by clicking on the Buy Now button. Last week I was invited to visit Compton Verney, to take a look at the work they have been doing over the winter to re-display the Chinese Bronzes collection. The walls of the galleries were freshly painted, but the rooms themselves were littered with carcasses of new display cabinets, ready to be fixed to the walls. The bronzes themselves were arranged in serried ranks upon the floor of an adjoining gallery, looking a little forlorn, but eagerly awaiting their new homes. Through Annelise’s and Morgan’s enthusiastic descriptions I left with a distinct impression of the new display lodged in my mind. It’s been an exciting and exhilarating year, and as my time as a Compton Verney Ambassador draws to a close I have a couple of updates on recent and upcoming collaborations. My prime focus throughout the year has been to shed a little light, through my blogs, on some of my personal favourites from this wonderful collection, including the fascinating George Smart (featured in the recent Folk Art exhibition), and a piece from their world-renowned Chinese Bronzes collection. These can still be found on my Writing and Other Diversions blog page. Earlier this month I completed my latest piece on Compton Verney’s glorious Female Saint, a centrepiece of their permanent collection. 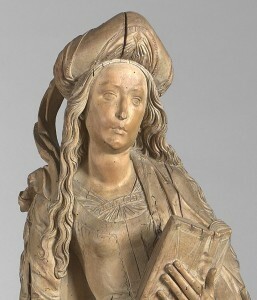 It was carved in the early 16th century by the peerless German wood carver Tilman Riemenschneider. You can read more about this sublime work by clicking here – The Limewood Master. 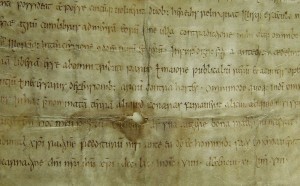 Once again my research was aided by unique access to Compton Verney’s archives. What a privilege! I have also been invited to visit the gallery in the New Year, to see work in progress on the re-display of their stunning Chinese Bronzes collection. Again this will be a unique opportunity to get behind the scenes, and watch this marvellous new gallery take shape. Watch out for my blog on the Chinese collection in late February 2015. Looking forward to seeing you there – and please leave a “Like” if you like what you see. I’ve recently joined The Green Room, a place “Where Writers Gather” to post content, put the world to rights, or just chill out with a cup of coffee and a gripping read. The site was founded in July 2014 by the author Rosy Cole, and attracts a vibrant group of international writers. It’s a fun and stimulating forum to post new or old writings, and you’re guaranteed a friendly and enthusiastic welcome. So if you write, in whatever capacity, or you’re an avid reader, why not drop by? Just click here: The Green Room. Happy reading! 27 August 2014: Thank You Canada! To some it may seem a small thing, but today I sold my first copy of The Lanese Print in Canada. That somebody should take an interest in my writing, let alone buy a copy of my book, is a perpetual source of wonder and delight. It’s no small thing, believe me! I’m delighted to announce that my new short story, The Moon Key, is now printed and published; and with it the fulfilment of a long-standing dream. I asked Pat Randle at Nomad Letterpress to see it through the press, and what a wonderful job he has made of it. 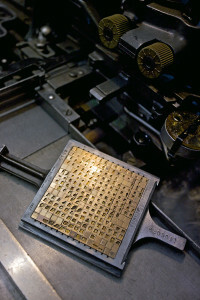 Pat runs Nomad Letterpress under the same roof as the Whittington Press, in the Gloucestershire village of Whittington. 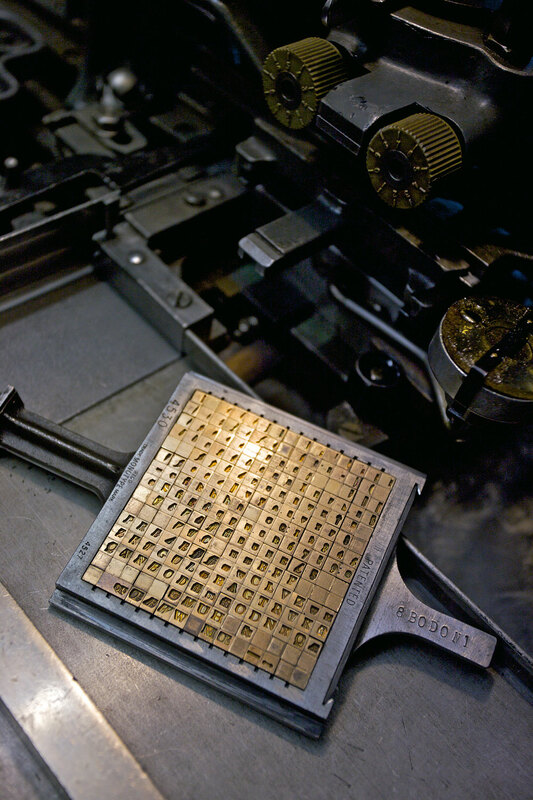 He continues the tradition of printing books and other items by letterpress, from type. 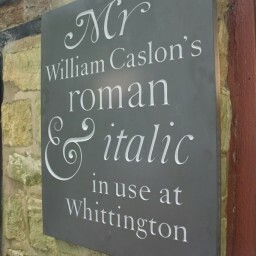 All through this fascinating process he advised me on the choice of typeface (in the end it just had to be Caslon), on the methods of typesetting and printing, and on paper. It was both a privilege and a joy to work with him on seeing the book through to production. 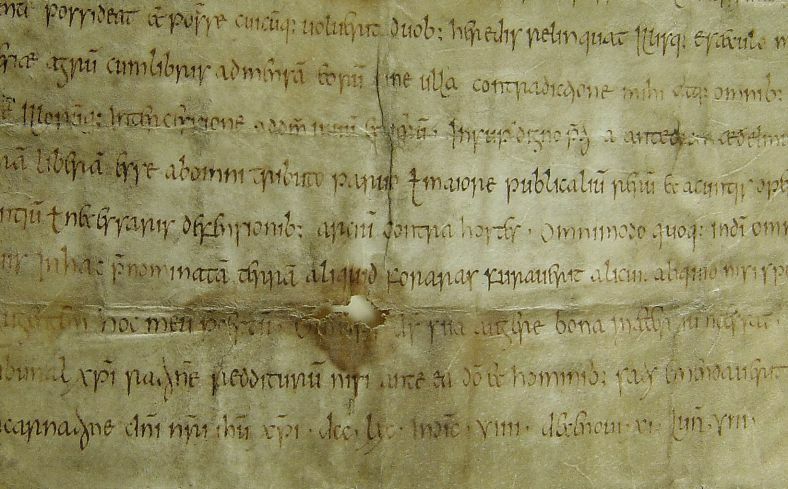 The end result is a kind of alchemy; a finely printed page, fashioned from base materials; from paper, ink and lead. What craftsmanship. For the binding I chose fine hand-made marbled paper from Jemma Lewis. The Moon Key is published in an edition of 50 hand-printed, numbered and signed copies, of which 45 are for sale. The Writers Room is a UK-based website for authors and readers alike. 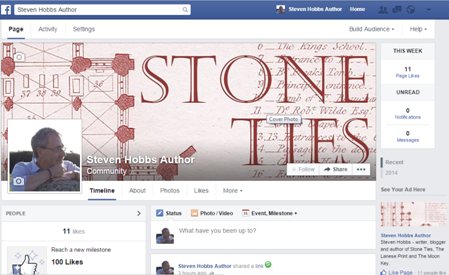 It’s a great site for authors to spread the word about their books. 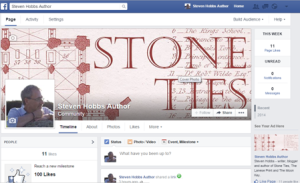 And readers get the opportunity to read about their books, leave feedback, ask authors questions, and share their answers with their friends via Facebook. I spent this morning at the press, discussing the galley proofs of my forthcoming short story and finalising ideas for the overall design. The text looks wonderful in beautiful old Caslon, and the covers promise to be beautiful too, wrapped as they will be in Jemma Lewis’s fine marbled paper. The final copies should be with me in a month or two, and at that stage I’ll release more details about the story, and the excellent press I have been working with. The story will be available in an edition of 50 hand-printed, numbered and signed copies. 5 copies will be retained for private circulation, but the remaining 45 will be available for sale from this site. The galley proofs for my forthcoming short story are on their way from the printers, and I have to admit I’m unashamedly excited at the prospect. It’s going to be a late summer release, so watch this space for further details and pictures! 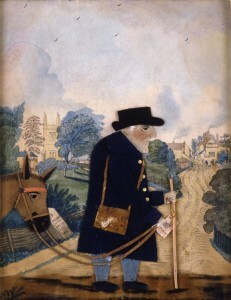 19 May 2014: Folk Art and George Smart “George who?” you may ask. To find out, go to my Writing and Other Diversions blog page (link opposite), and read all about this little-known master of English Folk Art. It’s the first of my collaborative pieces about some of the treasures of the Compton Verney collection. I had a wonderful time researching it, and talking to the specialists at the gallery. I’m really starting to relish my ambassadorial role – what a fascinating place. Watch out for more Compton Verney blogs in the coming months, including a piece on their magnificent collection of ancient Chinese bronzes. Picture credit: Old Man and Donkey by George Smart. Collage on paper, 1833. © Compton Verney, photograph by Prudence Cuming Associates Ltd.
What a wonderful start to the month! I spent a fascinating morning with Compton Verney’s specialist on Chinese bronzes; and what a privilege it was, to be shown around their marvellous collection, and introduced to all the rich idiosyncrasies of design and construction. The aim of the visit was to gather information for a forthcoming series of blogs I am planning (with Compton Verney’s backing and support) on particular pieces from their collections that move or captivate me. 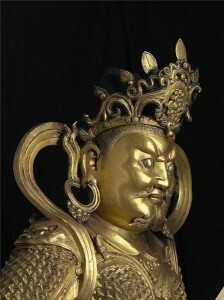 So keep an eye on my Writing and Other Diversions blog page for upcoming pieces on Chinese bronzes, and English Folk Art. It’s a thrilling development for me, and a wonderful opportunity to share my love of this fascinating and unique gallery. It’s great to be chosen as one of Book Viral’s Spotlight authors, and to be in the company of so many great books, and wonderful covers. 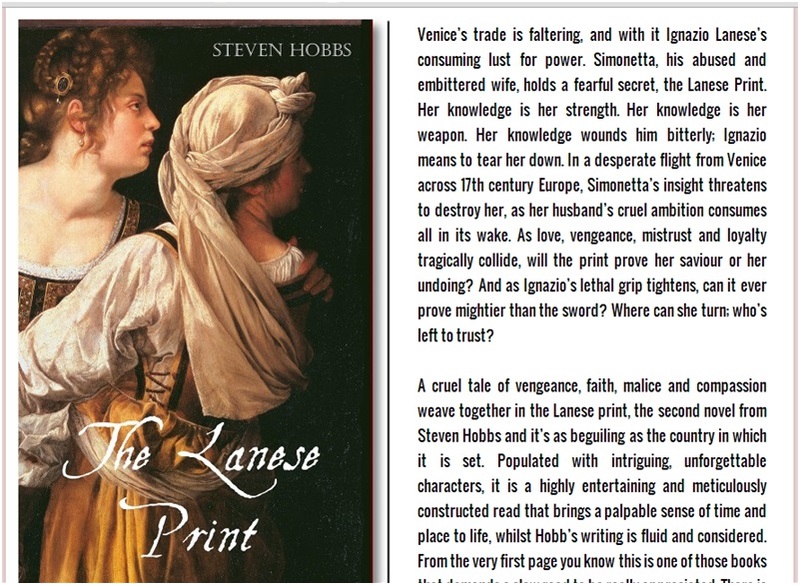 Click on the link in the 18 April post below, to read what Book Viral really think about The Lanese Print. I’m thrilled with this review of The Lanese Print from Book Viral (click on their logo below to read it). Thanks for the kind words guys! 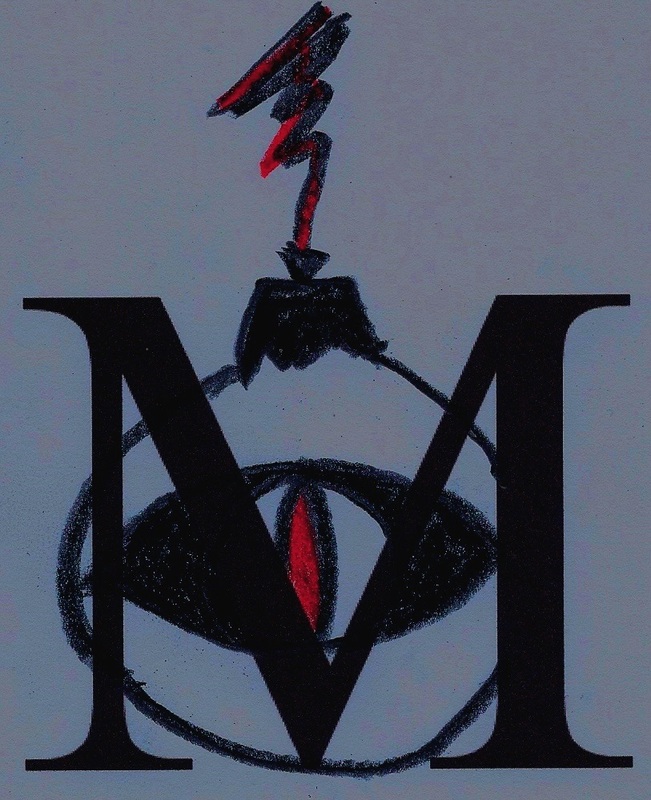 Wednesday 16th April proves to be an exciting day – I’m off to the press to see the first trial proofs of my forthcoming short story. Given the history of the press (more will be revealed later!) I can’t wait to see the outcome. Call me romantic, old-fashioned, what you will – but the beauty of fine type on a page gives me great pleasure. There’s still plenty to do before publication day (it’s looking like late August at the moment), but I’ll keep you updated here. Keep an eye on my Writing and Other Diversions page over coming weeks for exciting new blogs on Compton Verney. There’s a wealth of fascinating information I’m eager to share on the gallery’s exhibitions, future programmes and initiatives. It’s going to be a great summer! Yesterday was a memorable day for me. Not only did I publish my latest novel, The Lanese Print, on Kindle (see below, or follow the link opposite) but I also had the exciting privilege of joining the Compton Verney Ambassador Scheme. I’ll write more about this in my blog, Writing and Other Diversions soon. 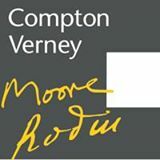 But I am hugely excited about working with Compton Verney to help increase awareness of this wonderful family friendly gallery. It’s a stunning place – watch this space! 5 April 2014: The Lanese Print – Out Now! I’m thrilled to announce that The Lanese Print is now available on Kindle from The Amazon Book Store. If you’d like to find out more, please visit The Lanese Print’s page opposite to read a taster and the Prologue, or visit the Amazon store. 3 April 2014: The Lanese Print – Coming Soon! The publication of The Lanese Print on Kindle is now only days away. I’m currently putting the finishing touches to the author’s notes, and then I’ll be doing the final formatting for publication. It’s been a long haul since I started writing the book, and it’s hard to believe that it’s finally ready to fly. For those who like a taster before they buy, I’ll be releasing the first chapter on this site soon. So keep an eye on The Lanese Print page (link opposite). 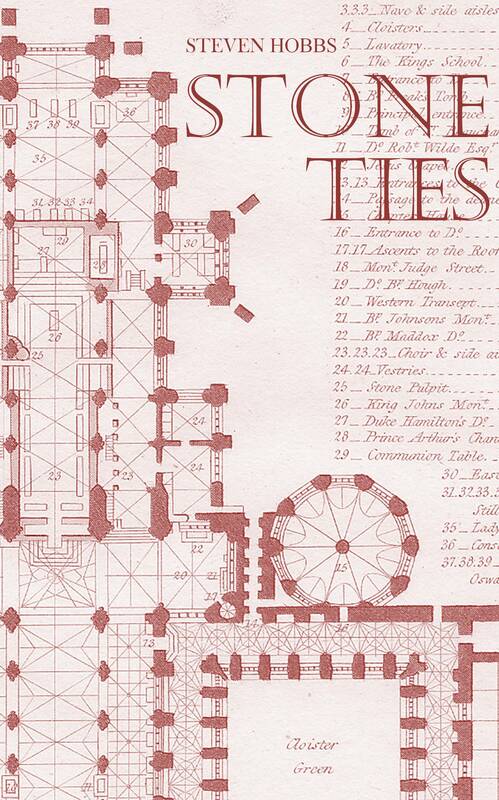 21 March 2014: Stone Ties - Spring Sale!! To celebrate the start of spring, and in anticipation of the forthcoming publication of The Lanese Print, I have reduced the price of Stone Ties on Amazon to $1.99 (approx. £1.20 in the UK). I hope this will give more readers an opportunity to enjoy this Worcester tale of history, mystery and romance. And if you’re still not sure, take a look at my Reviews page (link opposite) and read some of the amazing things people have said. Happy reading, and have a wonderful spring. I have just reached an agreement with one of the UK’s finest private presses to print a small edition of a new short story I have written. To have the opportunity to work with such an illustrious press is both exciting and a great honour. The project is in the very early stages yet, but I am planning a publication date around late August 2014. A small number of hand-printed, numbered and signed copies will be available for sale from this site. I’ll release more details as the work progresses. I’ve received feedback from the first of my beta readers. Her comments were excellent and have lead me to consider the addition of a new chapter which will considerably strengthen the plot. In addition she picked up on a number of minor issues, which once addressed will improve the credibility of a couple of the main characters. If all goes well I’m planning for an end-of-January completion for this draft. I’m expecting the draft of The Lanese Print back from my beta readers in the next couple of weeks. It’s an understatement to say I’m on tenterhooks, but I can’t wait to get back into the final edit, and hone the draft down to its final state. Then it’s a simple (?!) matter of completing the synopsis and blurb, and deciding on the appropriate route to take, i.e. submission or self-publish. 2014 is likely to be an exciting year whatever the outcome. It’s done! After nine months of trials and tribulations the first draft of The Lanese Print is complete. Though I’m thrilled to have got to this stage, somehow I think the really hard work is just about to start. 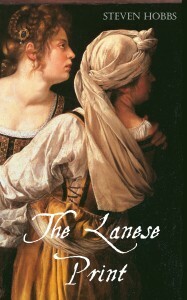 I’m delighted to reveal the cover design for my forthcoming novel The Lanese Print. The image (a detail from the painting Judith and Her Maidservant by Artemisia Gentileschi) beautifully reflects the relationship between the two main protagonists. Take a look at The Lanese Print’s page on this site for further details. Last night I gave my first reading of the opening chapter of my new novel, to the Worcester Writers’ Circle. It was a great experience, and I was delighted by the friendly welcome, and positive feedback. At this stage in the writing process (I’m a little over half-way through the first draft) it’s greatly encouraging to hear that you’ve laid the foundations effectively, and captured readers’ imaginations. Thank you WWC, you’re a great group, and I’m delighted to be a member. A couple of weeks ago I attended my first meeting of the Worcester Writers’ Circle. The Circle was established in 1941 and has been meeting regularly ever since, making it one of the longest continuously active groups in the UK. The Circle includes both professional and amateur writers, active in many different forms and genres. Members are encouraged to bring work to read at the bi-monthly meetings. Primarily a critiquing group, the Circle offers encouragement and constructive criticism. Regardless of their skills or experience, members benefit from the friendly and enthusiastic feedback, and take away with them fresh insights into their writing. On Tuesday 15th October I will read the opening pages of my new novel. It’s a daunting prospect, as I’ve never read aloud to an independent group before. However I’m sure the Circle will be as friendly and supportive as ever, and I’m strangely looking forward to it. I’ve just finalized the license agreement for the cover design of my next book. I’m delighted with it, and eager to reveal all, but sadly I’ll have to wait until publication day. December (or thereabouts) should see it done. Still writing! 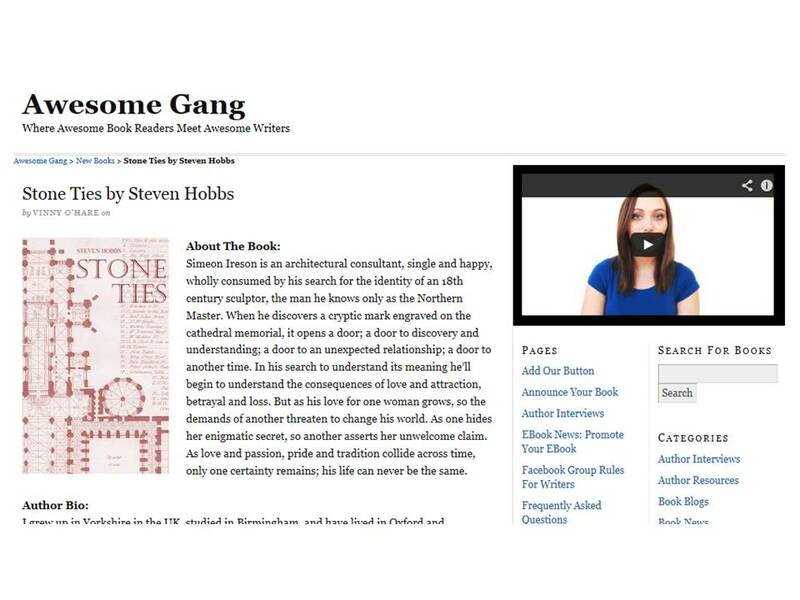 Throughout August you can find Stone Ties on the Indie Book of the Day Bargain Bookshelf. Why not follow the link and get yourself a bargain! Stone Ties managed to trouble the Amazon charts over the weekend, peaking at no. 21 in the UK Free Kindle – Historical Fiction chart. It’s a great start and I’m so grateful for everyone’s support. Thank you. I’m celebrating another successful weekend of free downloads for Stone Ties. Many thanks to all my new friends in the UK, USA, Germany, France, Italy, India and Brazil for downloading free copies. Your support means so much to me. And if you enjoy the book, please leave a review on Amazon – it would make my day! Stone Ties is available for free download from Amazon from 6th – 7th July 2013 (that’s Saturday to Sunday). If you would like to download a free copy please follow the link from my “About Me” page to the Amazon site. 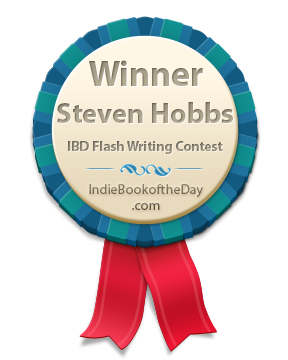 I’m delighted to have won the Non Fiction category of the Indie Book of the Day Flash Writing competition. 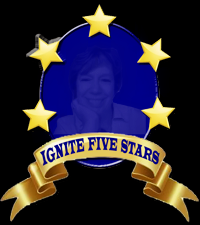 It’s been a few weeks since Ignite reviewed Stone Ties (and a great review it was too) and awarded it five stars. Browsing her site recently I noticed this badge, and now wear it with pride! 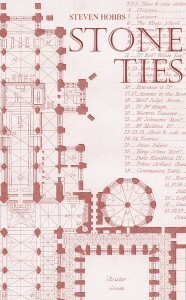 Many thanks to all those who helped make the free promotion of Stone Ties such a success. Over the holiday weekend 535 copies were downloaded, exceeding all my expectations. I’m so grateful to everyone who chose my book, especially those in the USA, UK, France, Germany, Canada and Japan. I really hope you enjoy it. Thank you so much! 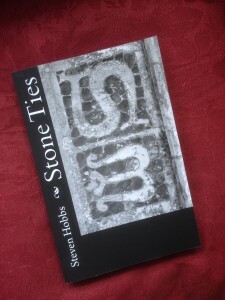 Stone Ties is available for free download from Amazon from 25th – 27th May 2013 (that’s Saturday to Monday). If you would like to download a free copy please follow the link from my “About Me” page to the Amazon site. 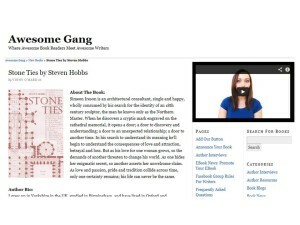 There’s a short feature on Stone Ties on the Awesome Gang website today (18 May 2013). To read it go to http://awesomegang.com then select “New Books” and browse through “PREVIOUS ENTRIES”. I’ve received confirmation that my Author Spotlight interview will be featured on the Free eBooks Daily website on 25 May 2013. I hope you get a chance to see it. 08 May 2013: Author Spotlight Interview I’m delighted that I’ll be the subject of an Author Spotlight Interview on the Free eBooks Daily website towards the end of May, to coincide with my first free promotion on Amazon. They were excellent questions (thanks Sharrel) and I had great fun answering them. I’ll confirm the date the interview will appear once I have it, and post a link on this site.